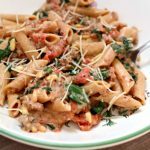 I have realized that when it comes to crockpot recipes the easier and less ingredients the better. So I’m going to try and come up with more recipes that have 5 ingredients or less in them. This is my first attempt of the new year to come up with this type of recipe. And I must say that I am very happy with the results. 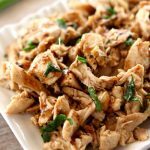 This recipe is simply boneless, skinless chicken thighs and a little bit of Newman’s Own Light Balsamic Dressing. You cook the chicken on low for 4-6 hours until the chicken is tender and shreddable. The taste is amazing and I loved eating this chicken on salad. Can I just tell you something? I absolutely love Newman’s Own Light Balsamic Dressing. My friend told me about it a few months ago and it has made my life so much better. How you ask? This dressing makes me excited to eat salads for lunch every day. And eating salads makes me feel healthier. And when I feel healthy I feel happy. So yay to this dressing! I’ve tried other balsamic dressings before but they aren’t as good. I promise, you will love this dressing. So pay the dollar extra for Newman’s Own brand instead of the store brand and you won’t regret it. Dave Ramsey Slow Cooker Rice and Beans–inexpensive and healthy! Slow Cooker Zucchini Lasagna Roll-Ups–low carb and high taste! 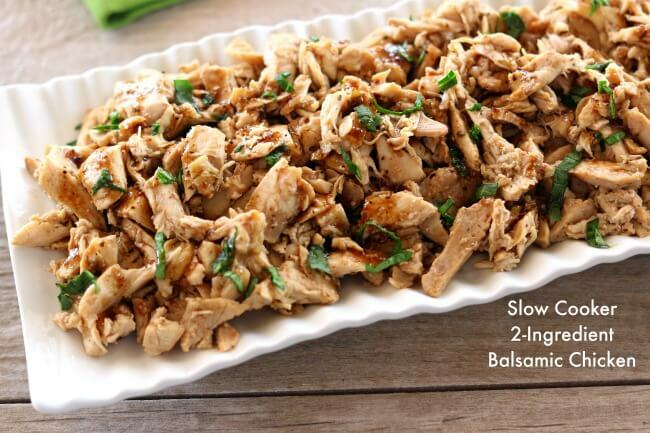 For Slow Cooker 2-Ingredient Balsamic Chicken I used my 6 quart oval Kitchenaid slow cooker. 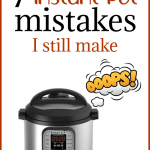 I love this slow cooker (you can see me talking about it in a video here). It cooks low and evenly. I love the medium heat choice because most slow cookers that I’ve seen only have the option of cooking on low or high. If you’re going to buy just one slow cooker, this is the one that I recommend. 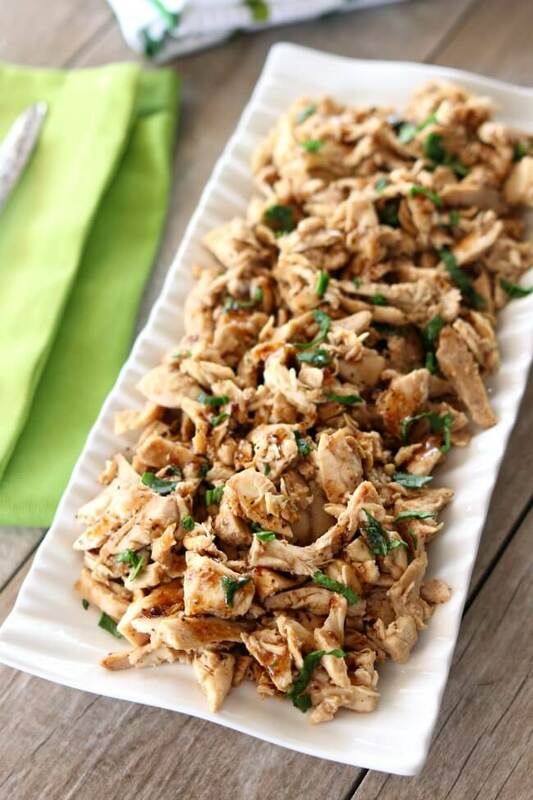 Tender, moist bites of shredded chicken flavored with a light balsamic dressing. 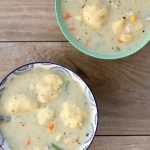 With literally only 2 ingredients and the fact that it’s made in the crockpot, this recipe couldn’t be easier to make. 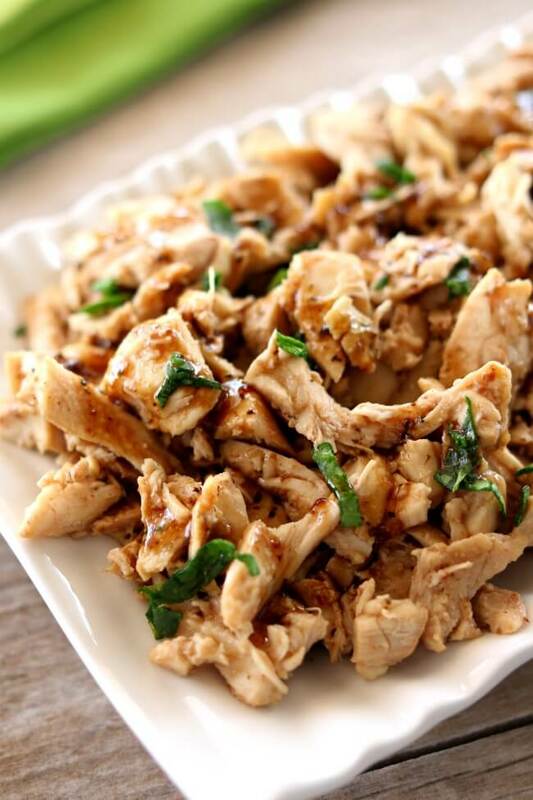 This balsamic chicken tastes great on salads, over rice or with a baked potato. Place chicken in the bottom of the slow cooker. Drizzle the chicken with 1/4 cup of the dressing (reserve the rest of the dressing for later). Cover the slow cooker and cook on low for 4-6 hours if chicken is thawed and 6-8 hours if chicken is frozen. Remove lid. Drain off excess liquid (mine had a lot of liquid since the chicken was frozen). Shred the chicken. Drizzle the remaining dressing over the shredded chicken and stir lightly. 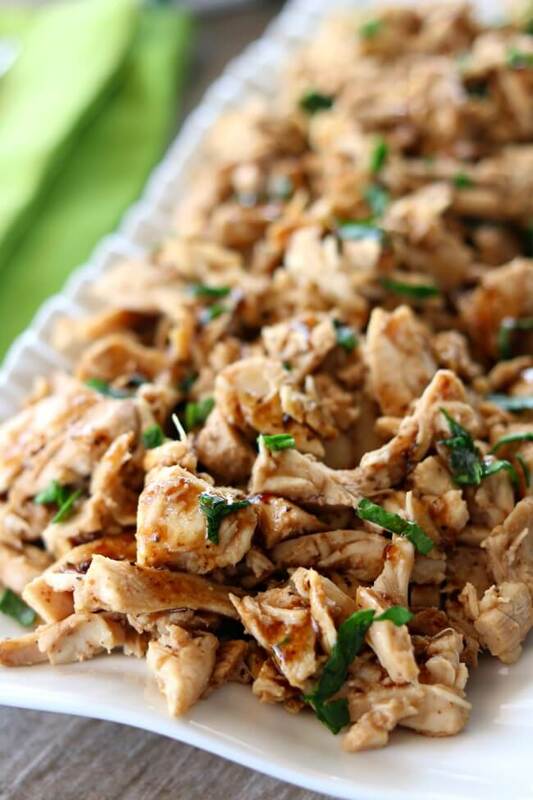 Serve chicken over salad or with rice or a baked potato. What are he little green bits shown in the picture? I think it was just chopped parsley for a little color. I think so. Basically you’ll want to cook the chicken until it’s shreddable and then add in the dressing. Place chicken in pan with the 1 cup of the broth OR water. Bring to a boil, then reduce heat to medium and let simmer for 15-20 minutes. 10 minutes if using fresh or defrosted chicken. Turn occasionally. Cover and turn to low. Continue to simmer chicken for 45-60 minutes or until the chicken shreds when you use a fork. Add more of the broth/water as you cook the chicken, if yours starts to cook down. Let rest in pan, for 10 minutes, or until the meat is cool enough for You to shred the chicken. Shred the chicken and then stir in the dressing. We live in the woods and our little grocery store tries to get whatever we ask for but they’re limited. Could balsamic reduction be used in place of the dressing, maybe add a few drops of balsamic vinegar to get the zing? 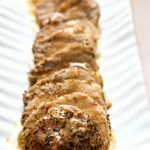 Are these frozen chicken thighs boneless? I’m going to try this recipe. Would this work well as a sandwich? It would be amazing as a sandwich! 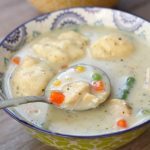 How can you make this with chicken breast meat instead of thighs? Hi Barbara, you can do that by only cooking on low for about 4 hours. Good luck! I agree that lite balsamic vinaigrette is the best dressing taste & healthwise, but disagree that Newman’s Own is better than generic. The Aldi brand of this is indistinguishable from Newman’s Own and half the price. It is part of their Fit and Healthy line, and if I was a betting woman, I think they are made as a private label brand by the same company. Thank you, Karen, for these awesome recipes! 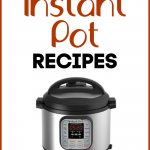 I’ve pinned several of them to keep my slow-cooker busy on these winter days. We are aiming for a healthier year here and these will surely keep us on track.